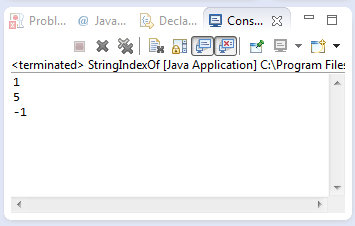 This java tutorial shows how to use the indexOf() method of java.lang.String class. This method returns an int datatype which which corresponds to the index of the string where the method argument str has been found. Note that since we are dealing with String, the index starts at 0. This method returns an int datatype which corresponds to the first occurrence index has been found. If the string parameter has not been found on our String, the value returned is -1. This example source code demonstrates the use of indexOf() method of String class. Basically this source code just prints the index of the str method argument on the String object.